We are extremely grieved for passing away of our well-beloved friend, Mr. Sargent Shirver. 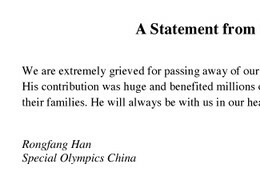 His contribution was huge and benefited millions of people with intellectual disabilities and their families. He will always be with us in our hearts.